Two volunteers featured on the town’s own radio station to talk about the important work of a local hospice. 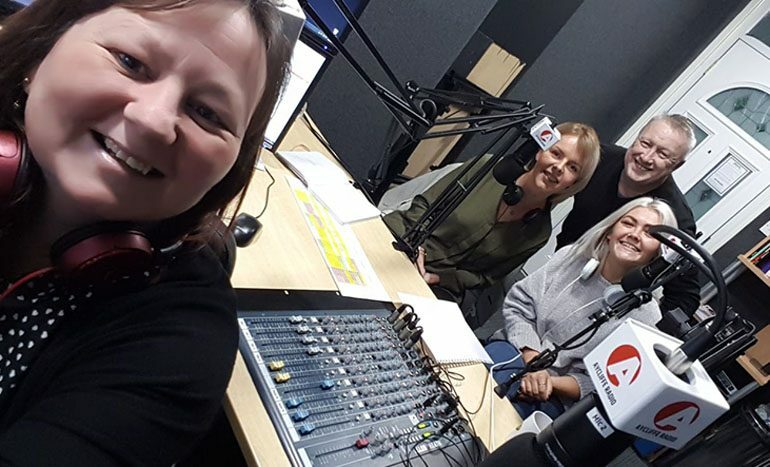 Milly Toner and Immogen Salt, from Butterwick Hospice in Bishop Auckland, visited the Aycliffe Radio studio last Sunday to talk to Mary and John O’Sullivan about the hospice and how people deal with grief. Butterwick have a day care service, and out reach centre, along with family support, home care and much more. Milly and Immogen discussed the misconceptions people have of a hospice and clarified all the different services Butterwick Hospice provide in the local area. They also talked about their experience working in Butterwick and how important volunteers are to the hospice. John, from the radio station, is a volunteer councillor with Butterwick Hospice and he explained the challenges he has come across over the last year and a half, along with the vast rewards the voluntary job comes with. “The work Butterwick Hospice does could not be done without the volunteers,” said Milly. ‘Conversations with Mary and John’ is broadcast 11-12 every Sunday. You can listen at www.ayclifferadio.co.uk or search for ‘Aycliffe Radio’ in your app store.